True to this heritage, the House is proud of its motto: "Only one quality, the finest". In its history there have been only 10 Cellar Masters at Veuve Clicquot. This has resulted in a never finding quest for quality and ensured the continuity of the Veuve Clicquot style: strength and complexity. Veuve Clicquot prides itself on excellence and quality. In the six Veuve Clicquot pressing centres, entire bunches of grapes are pressed together, making it possible to separate the juices to obtain an uncoloured must from black grapes. To take full advantage of the specific characteristics of each Champagne terroir, Veuve Clicquot carries out separate winemaking processes for each grape variety, fraction and cru in one of the 29 presses. As a result, beginning with the pressing process, the unique character of each grape’s provenance is carefully respected. The maximum authorised yield of must for every one "marc" (the pressing unit for 4000 kg of grapes) is 2550 litres. This can then be broken down into 2050 litres of "cuvée" (the first and best-balanced juice) and 500 litres of "taille". In the interest of quality, Veuve Clicquot generally uses only the "cuvée". The musts obtained from the presses rest for between 15 to 24 hours in the vats for “débourbage” (the process by which the solids - or bourbes - suspended in the musts are left to settle to the bottom of the vats). In order to trigger alcoholic fermentation, natural yeasts are added to the clarified musts in the stainless steel vats, maintained at a steady l6°C. After eight to ten days of alcoholic fermentation, we obtain a still wine with 11% alcohol - or in other words, non-sparkling wine - which is then subjected to a first blind tasting by our wine makers. Approximately 700 samples are tasted. Veuve Clicquot then conducts a second fermentation, which is not mandatory in the Champagne method but helps to reduce the wine’s acidity by transforming the malic acid into lactic acid. This process, known as malolactic fermentation, plays a vital role in determining the Veuve Clicquot style. A small percentage of the wine is fermented and aged in large oak vats to increase complexity. A tasting committee of the first order (12 oenologists), under the leadership of Dominique Demarville, our Cellar Master, meets from November to March to taste the wine destined for the blends. 700 to 800 wines are tasted and ranked by category. Each wine will be assigned to the year's cuvée, to the reserve, to the vintage wines if required, or simply discarded if it does not meet the house's quality criteria. Blending is a subtle art: it requires not only assessing the wines as they are today, but also the ability to anticipate how they will develop in the future. The blending team must also comb through the reserve wines, kept for 10 to 20 years, to uncover the typical flavours that will uphold the Veuve Clicquot style in light of the wines' harvest year. 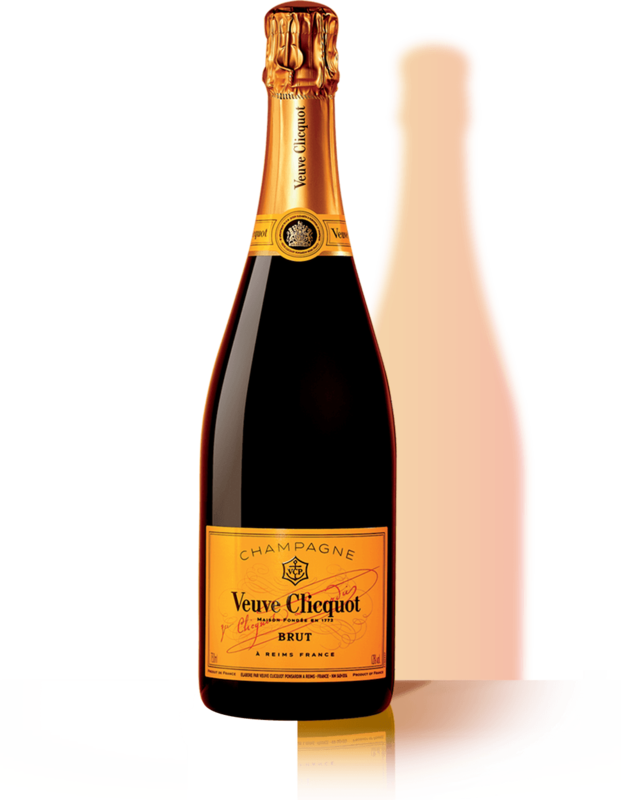 Veuve Clicquot Brut Yellow Label is blended using approximately fifty different crus, of which 25 to 40% is reserved wines. In good harvest years, the Tasting Committee, made up of the Cellar Master, the oenologists and the President, decides to create a vintage wine, i.e. a champagne composed exclusively of wines from that harvest year: Vintage, Vintage Rich, La Grande Dame. These wines share the potential to age exceptionally well. The wine is then drawn, or put in bottles, before a dosing liquor is added along with yeasts in order to trigger the "prise de mousse", the step in which a still wine becomes sparkling. The second alcoholic fermentation creates excess pressure in the hermetically sealed bottle, causing the wine to become sparkling. Then the bottles are laid horizontally on lees to age. This step is extremely important as the slow autolysis of the yeasts is essential for quality. The bottles are aged in the Veuve Clicquot Gallo-Roman and medieval chalk tunnels in Reims, the Crayères, safely away from any light and vibrations, at a constant temperature of 10-12°C. At Veuve Clicquot, all non-vintages are aged for a minimum of thirty months and vintage wines for a minimum of five years. La Grande Dame is aged for a minimum 7 years. As a perfectionist, Madame Clicquot wrote: "We require our wines to flatter both the palate and the eye". Thus in 1816, Madame Clicquot invented the first riddling table, ancestor of the rack, in order to obtain clear wines. This method was later adopted by all the Champagne houses and is still used today. Riddling involves collecting the sediment of dead yeasts in the neck of the bottle to facilitate extraction. One or several daily rotations (one quarter, one eighth, one sixteenth of a turn) are needed. The operation is carried out in an increasing inclined position. Today, the riddling process is semi-automatic and semi-manual. Only bottles of La Grande Dame and large formats are riddled by hand. The traditional expertise of the riddler involves precise movements which are fascinating and require a lot of experience. They are a valuable intangible heritage that the house seeks to preserve and pass on. The bottle of the neck is then cooled to a minus 26° C. Trapped in a block of ice, the deposit is forced out by the pressure when the cap is removed. This process is known as disgorging. The next step is dosing the champagne, which at this point is still a dry wine. The quantity of dosing liqueur (or liqueur d’expédition) will determine the type of champagne obtained : brut, sec, demi-sec... Veuve Clicquot champagnes are very lightly dosed (10 grams/litre for the Brut Carte Jaune). Today, the riddling process is semi-automatic and semi-manual. Only bottles of La Grande Dame and large formats are riddled by hand. The traditional expertise of the riddler involves precise movements which are fascinating and require a lot of experience. They are a valuable intangible heritage that the house seeks to preserve and pass on. The bottles are corked and muzzled by a twist of wire, known as the 'muselet', which keeps a metal cap, showing an image of Madame Clicquot, in place on top of the cork. Veuve Clicquot corks are subjected to strict tests. After an additional resting period of several months to perfect the mix of aromas, they are inspected visually and dressed: cap, collar, label and back label. Veuve Clicquot also cultivates its unique style through its packaging which is regularly subject to numerous innovations and exclusive designs. Once packaged in cartons, or wooden boxes for certain vintages, they can be shipped.